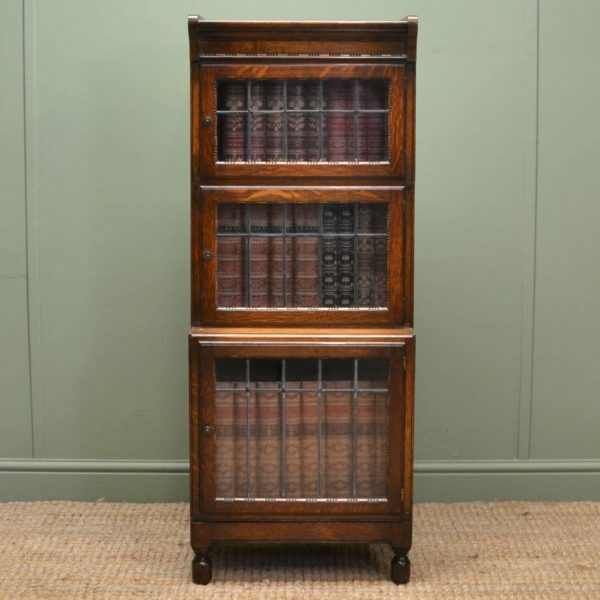 Antique Barristers Bookcases were first seen in The late Victorian period and was usually stacking with cabinet glazed doors that open on a hinged mechanism, in the same design as the Globe Wernicke Bookcase or the Minty design. They were designed to store books or other office documents and were commonly seen in solicitors offices, libraries or Schools. 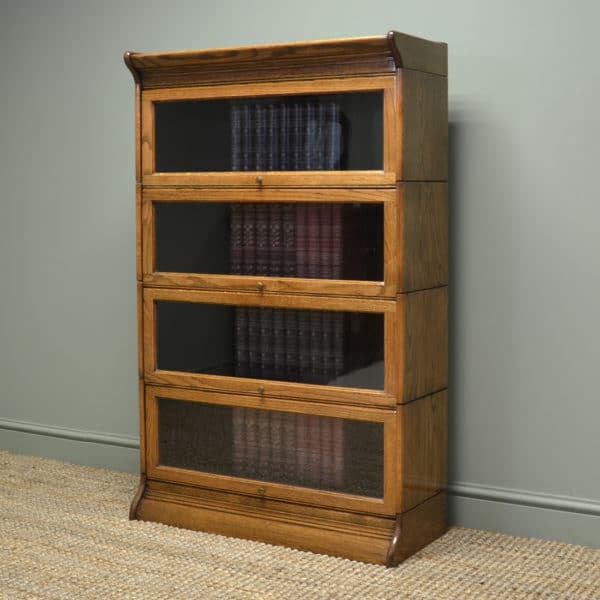 The beauty of these antique bookcases, you were able to order them in any height as they simply stacked on top of each other so you could have just one or several heights dependant on how much storage you needed. They are extremely collectable as they can house a large book collection and are quite a unique design. The best examples were in Oak and Walnut and still retaining the original makers stamps. Have a look below at our lovely examples available for sale. 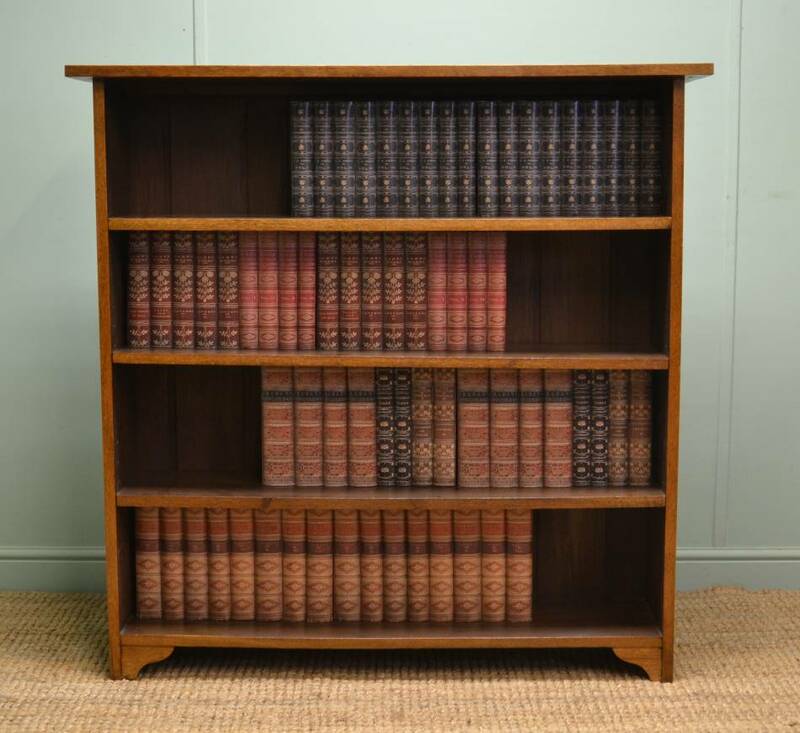 ‘Minty’ Edwardian Antique Office Bookcase of Small Proportions. 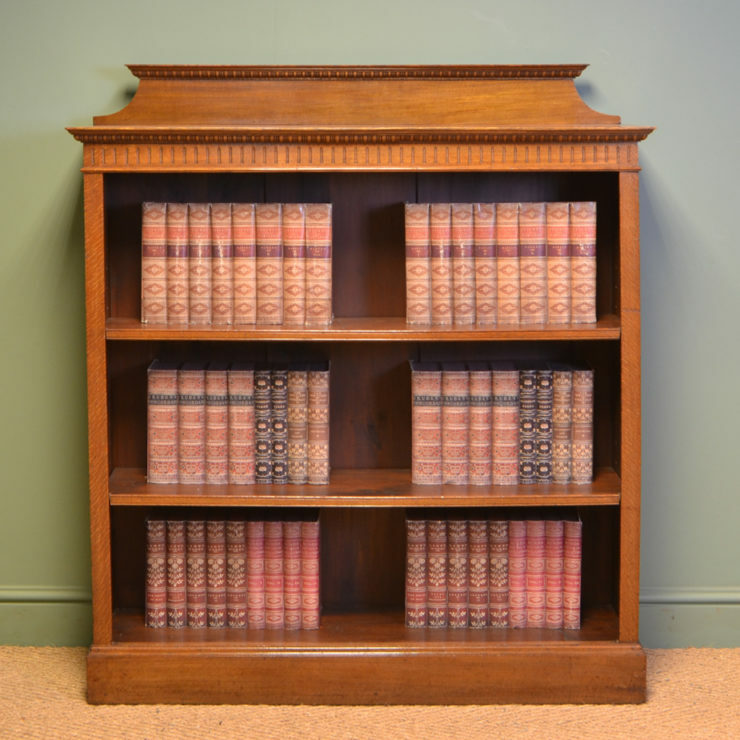 Below are a few examples of previously sold Barristers bookcases but if any particular style looks of interest please let us know as we do get many similar designs in stock and we can try to locate something similar. 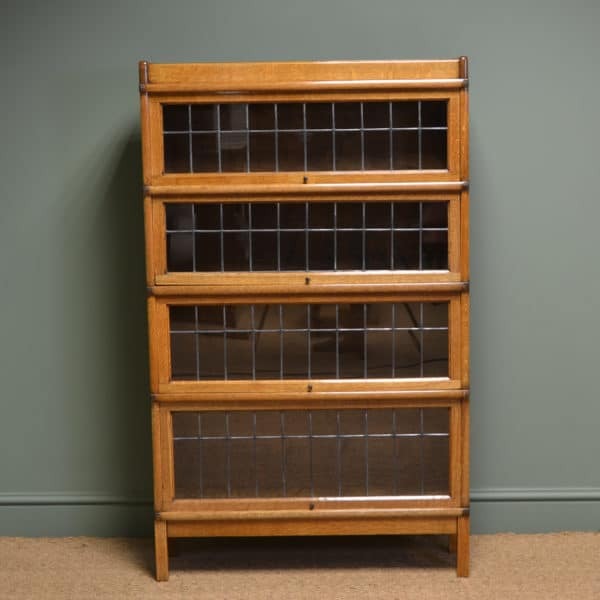 Small ‘Minty’ Oak Antique Barristers Bookcase. 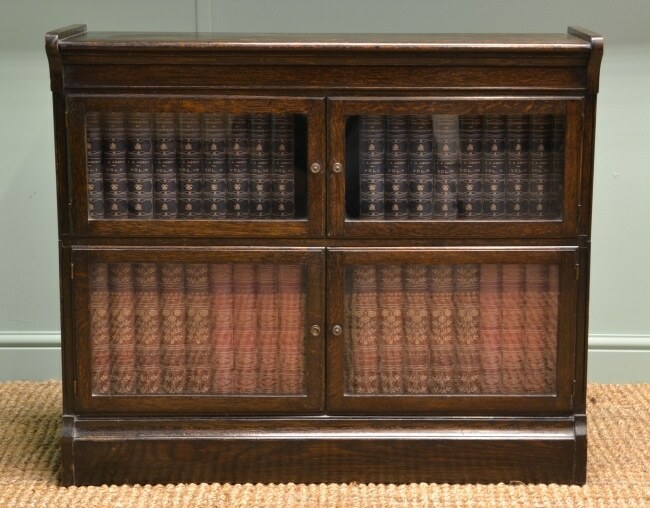 This original ‘Minty of Oxford’ bookcase is made from oak and dates from around 1930. This two sectional bookcase would provide an ideal storage option for cds or dvds. 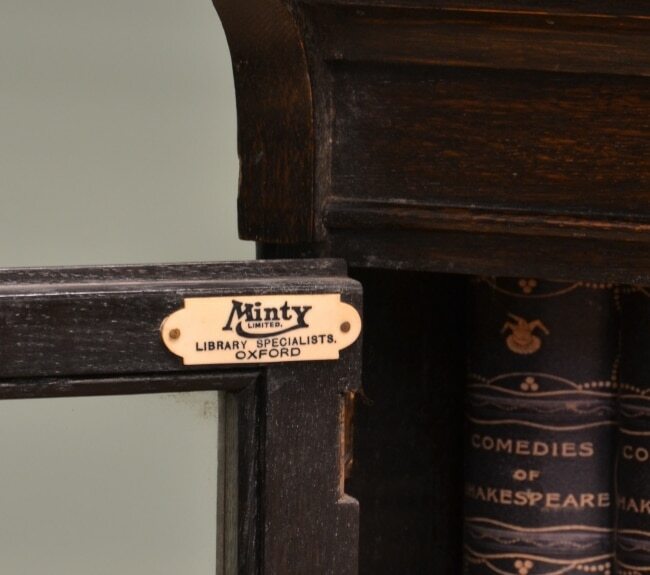 It has the original ‘Minty’ label on the interior, shaped sides and four glazed doors with brass handles. 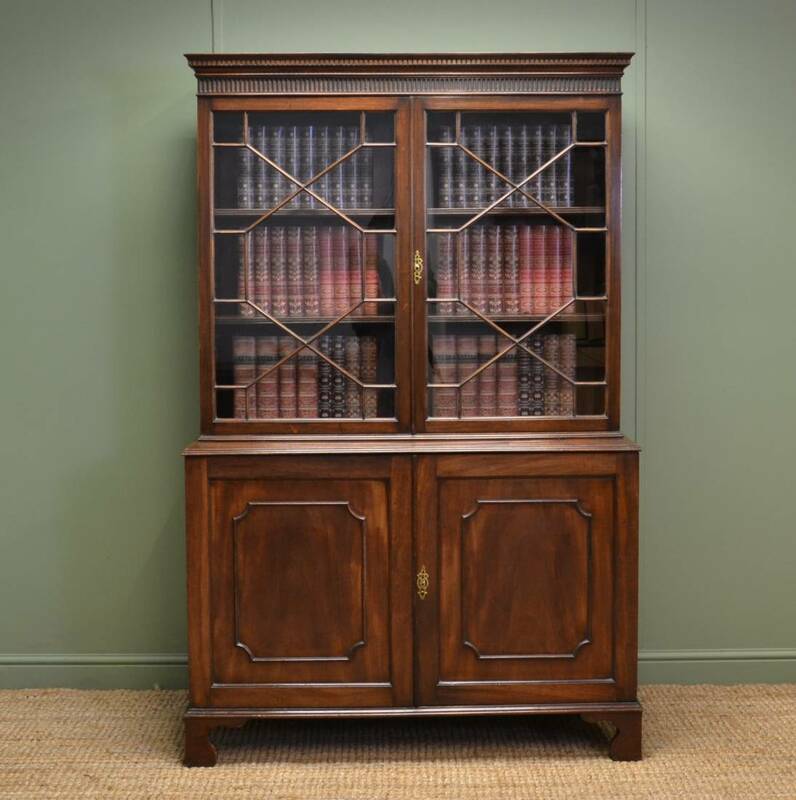 Tall, Antique, Solid Oak, Arts & Crafts Open Barristers Bookcase. 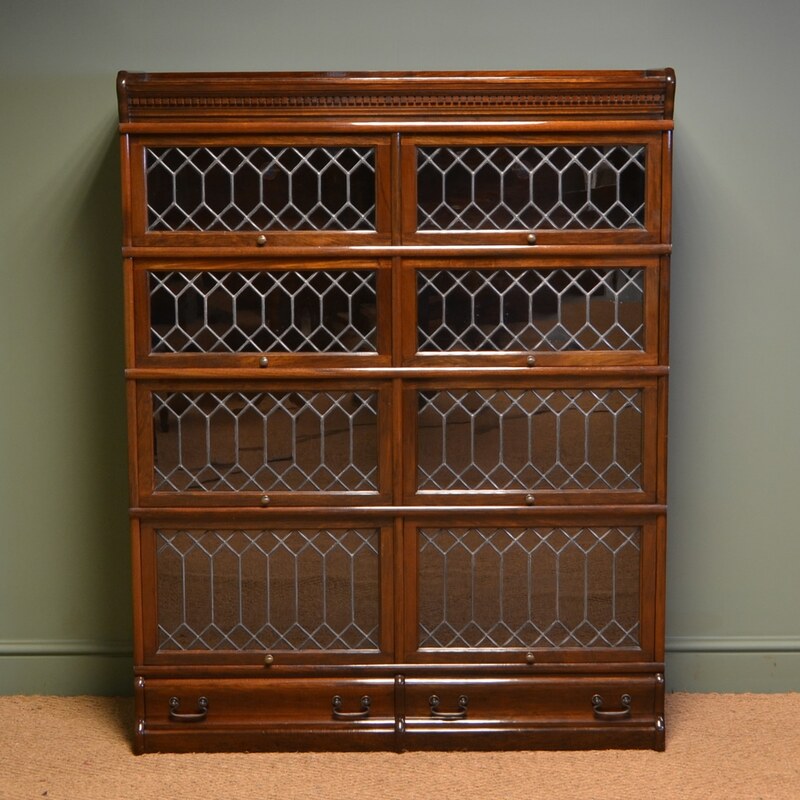 Dating from around 1900 in the Edwardian period this beautiful Arts & Crafts antique open bookcase is constructed from solid oak. It has a beautifully figured rectangular top above three adjustable shelves. Its stands on shaped bracket feet and still displays the original oak back boards. 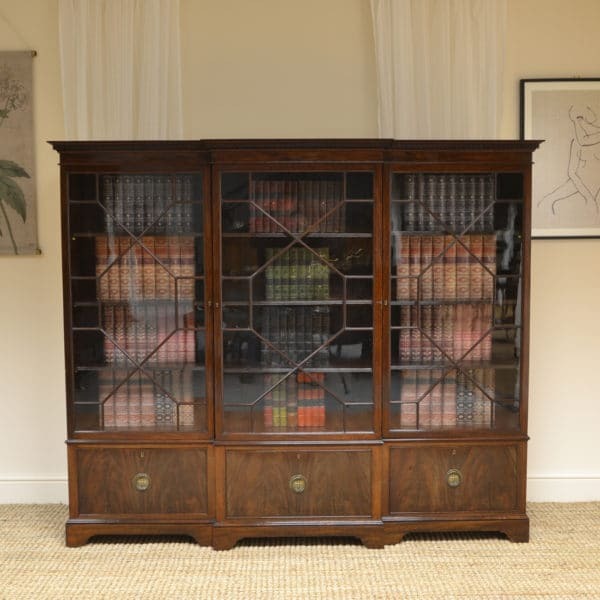 This delightful piece is simple in design but is of superb quality, a lovely example of the Arts & Crafts movement. 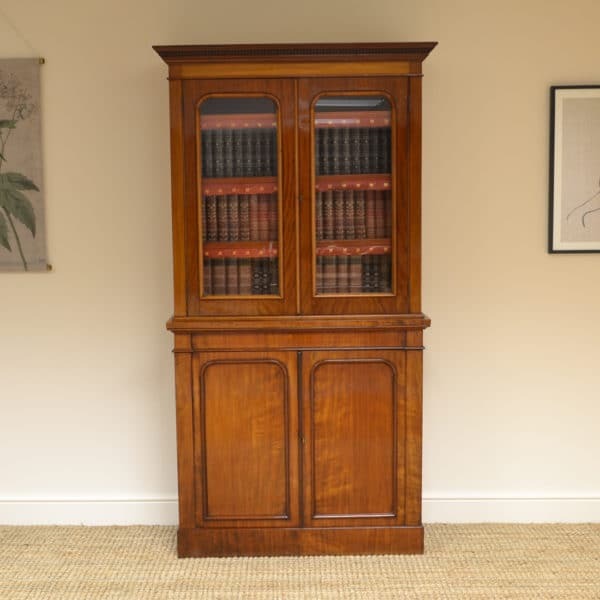 Dating from around 1890 in the Victorian period this delightful mahogany antique bookcase has very desirable small proportions for the modern home. Based on a Georgian design but crafted by the Victorians the bookcase has a moulded cornice with dental moulding and thumb moulded decorated frieze. This sits above two astragal glazed doors with key and working lock along with brass key escutcheon, the interior of the cabinet having three adjustable shelves. The base is low waisted with a rectangular moulded top above two cupboard doors with central panels framed with decorative mouldings, key and working lock. The interior of the cupboard has a single removable shelf and the whole piece stands on shaped bracket feet. Victorian Mahogany Glazed Antique Barristers Bookcase Above Fitted Cupboard. 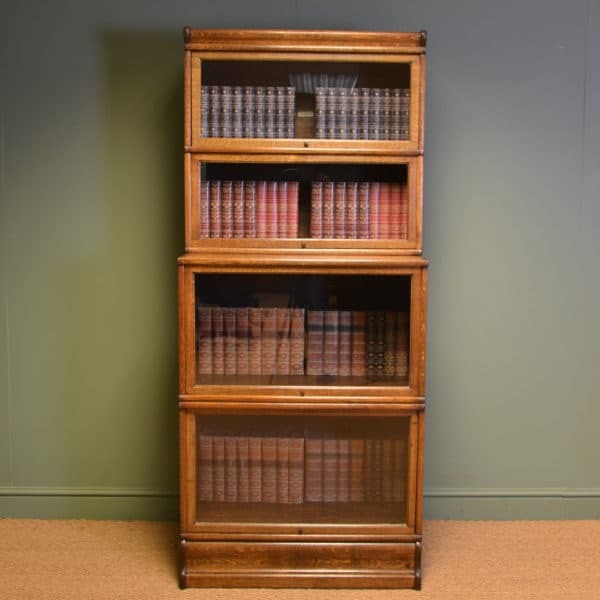 Dating from around 1870 this wonderful antique Victorian mahogany bookcase has a glazed front and sits above a cupboard with fully fitted interior. It has a moulded cornice with rounded corners above two glazed doors with arched mouldings, key with working lock and original Gillows style turned handle. The interior has three adjustable shelves and the original makers label of “S & H Jewell, Little Queen St. Holborn”. The lower section has a rectangular moulded top with rounded corners above two cupboard doors with central fielded arched panels, moulded edges and original Gillows style turned handle. The interior has been fully fitted out with letter racks, perfectly sized for todays A4 paper, an ideal solution for storing household paperwork! This impressive piece stands on a plain rounded plinth with original back boards and splits into two for ease of removal. 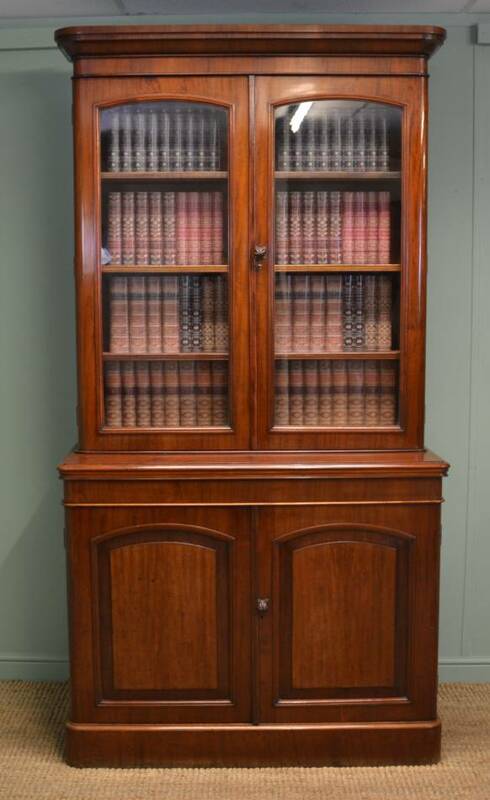 Superb Quality Antique Edwardian Mahogany Three Door Glazed Barristers Bookcase – by Duce & Co. 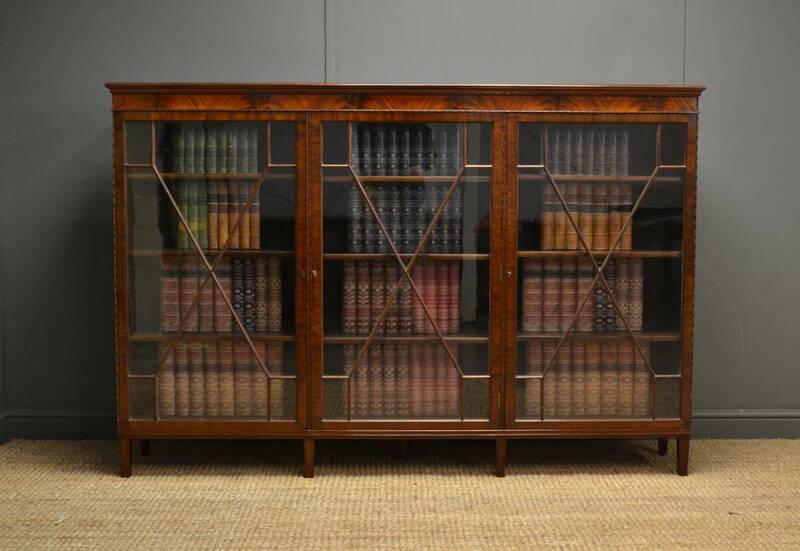 This antique Edwardian, superb quality, mahogany three door glazed bookcase dates from around 1900 and still has the makers stamp Duce & Co. of Baker street London. The rectangular moulded top displays wonderful cross banding with satinwood inlay and sits above a deep flamed mahogany frieze with decorative moulded edge. The three astragal glazed doors still have a key with working locks and front an interior that contains three adjustable shelves.